A finance solution must have the flexibility to adapt to these situations while integrating the changes required within a solid and well structured process. The quality of the solution supporting this effort will directly influence the CFO’s contribution to the strategic decisions. The CFO’s expertise is essential to build the firm’s strategy and plans. The CFO is the one who will quantify the strategy’s feasibility and results under the financial rules and constraints such as capital requirements and the leverage ratio. That puts the solution at the core of the process. It is a growing concern across financial services industry to improve the finance process by reducing manual interventions while automating processes and controls. Using granular information and workflows, OneSumX for Finance is able to automate detailed reconciliations and facilitate controlled adjustments, shortening the through-the-cycle time and freeing up time for added value activities. Regulatory changes are both compelling and recurring: they absorb significant efforts and energy. Wolters Kluwer Financial Services constantly tracks these changes and we embed our understanding into our solutions. Our finance solution implements current regulatory changes, such as IFRS, manages new data requirements and calculations, and accelerates the disclosure process with complete transparency. Whether triggered by internal changes, such as new products and entities, or by regulatory changes, finance departments are under pressure to streamline and centralize accounting. Solutions managing granular information across businesses will improve quality and consistency, provide efficiency gains as well as facilitate and speed up global reporting and analysis. With constantly evolving regulatory requirements, increasing data needs and a business scope that is changing more quickly as it grows, flexibility is a necessity for the finance function to meet its objectives. All data specific to the finance industry and to the requirements of finance are modeled and managed within a centralized data architecture through full data management capabilities, validation and reconciliation as well as valuations and data enrichments. The single data architecture for finance, risk, and regulatory reporting manages the business data that the finance department accounts for, ensuring a two-way link between business and finance. Together with full event management functionality, the solution offers a powerful accounting engine capable of supporting complex multi-GAAP accounting schemes, generating rich content accounting movement at the most granular level. Users can configure accounting schemes using any data element of the single data architecture through a user-friendly interface, enabling automated documentation, preview and drill-back. Customizable off-the-shelf chart of account and accounting scheme templates are available to support most GAAPs, including IFRS. Beyond the standard accounting processes, OneSumX for Finance offers a sub-ledger that links together balances and contracts at a most detailed level, ensuring reconciliation and fully supporting the demanding analysis and control requirements. It has the rare capability of delivering across products. In a single step it can pull up the full business details and accounting details that many processes require such as capital requirements calculations and regulatory reporting. The solution is genuinely multi-entity, multi-GAAP and multi-currency. It supports foreign exchange processes, the automatic generation of complex financial statements structures and multi-level consolidation. It fits multi-country and multi-time zone environments, enabling regional and global finance integration. The business intelligence capabilities provide the different user profiles with a variety of reporting and analysis techniques such as standard reports with built-in drill-through, ad-hoc reporting, multidimensional analysis and dashboards on computers and mobile devices. Additionally, the wider OneSumX solution suite can seamlessly automate regulatory reporting in nearly 50 countries around the world. An additional layer of specific configuration and processes supports IFRS throughout the accounting process, from event to disclosure. The solution manages IFRS classifications and performs IFRS calculations such as amortized cost, impairment, hedging and fair value. The built-in IFRS business logic enables automated handling up to final disclosures. OneSumX for Finance supports product control by automating intra-day P&L production and attribution, granular reconciliation of multiple sources, limits and price verification. Its trade and P&L adjustments workflow improves control and reduces risks. It ensures timely reporting of P&L and key performance indicators (KPIs). OneSumX for Finance enables strategic planning through simulations taking into account the various factors influencing balance sheet and P&L. Strategic planning can then be translated into planning and budgets. Forecasting and monitoring functionality enable management to be in control and to take appropriate decisions as soon as needed. Wolters Kluwer Financial Services’ finance solution performs all required financial industry-specific calculations and processes to streamline accounting from event to disclosure in a fast, transparent and fully-controlled way. It further supports firms in their strategic planning, budgeting and forecasting through simulations and analytics. Centralized data management is unique to our finance, risk, and regulatory reporting solution suite elements as it manages financial industry-specific business data that the advanced subledger balances account for. The bidirectional link between business and finance data, at the most granular level, guarantees complete reconciliation, audit trail transparency and accurate reporting across business and finance. The flexibility of of the OneSumX ecosystem of solutions is valued by our customers because it provides the best solution fit to their business situation, optimizing effectiveness, speed, accuracy and resources. The flexibility is key for them in order to adapt to the fast-moving environment with new entities and products on the business side, and new calculations and reporting requirements on the regulatory side. Wolters Kluwer Financial Services has been named “Leading provider of IFRS technology solutions” by Chartis Research. This demonstrates the quality and the richness of our IFRS solution as well as the expertise of our professional services teams to successfully help our customers in implementing IFRS from event treatment to final disclosures. 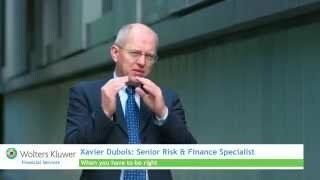 On top of our technology, Wolters Kluwer Financial Services provides content developed by our experts. Standard chart of accounts, accounting schemes and the seamless delivery of IFRS regulatory reports are examples of content showing the level of expertise we invest in to help our customers and to stay on top of the rapid evolution of regulation. The finance solution is part of the unique data architecture connecting the finance, risk, and regulatory reporting elements of OneSumX. Whilst regulators are boosting complexity, granularity and reporting requirements, the OneSumX ecosytem of solutions provides interlaced governance, finance, risk and compliance management to support current activity and build for the future.